The North American Meat Institute has announced that the Center of the Plate Training® will be held at the Rosenthal Meat Center, Texas A&M University, College Station, Texas, June 5-7, 2018. Center of the Plate Training® is a three-day course designed to teach the fundamentals of meat specifications by giving a first-hand look at how carcasses are converted to cuts commonly used in retail and foodservice. It is a lively learning experience that includes a detailed cutting demonstration of all the major center of the plate protein items: beef, veal, lamb, and pork, as well as sections on poultry and processed meats. Participants will come away with an increased knowledge of center of the plate items and a personal copy of the Meat Buyer’s Guide®; for over 40 years, the authoritative Guide to meat and poultry identification. 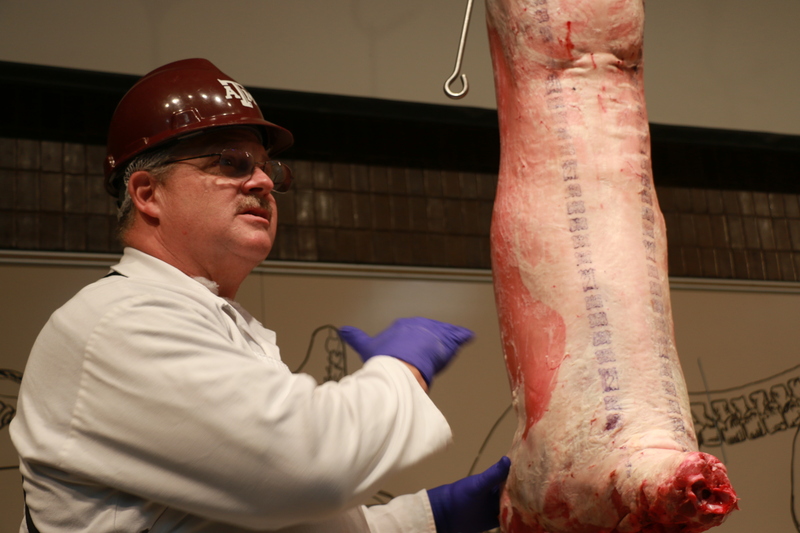 The Texas A&M University instructors include Davey Griffin, Professor and Extension Meat Specialist, and Jeff Savell, University Distinguished Professor, Regents Professor, and E.M. “Manny” Rosenthal Chairholder. Both Griffin and Savell have extensive knowledge of anatomy, grading, and cutting procedures, which adds so much to the training and the participants’ experiences. The IMPS numbering system, purchaser specified options, and a knowledge of the meat items as described by the Meat Buyers Guide. How standards keep products consistent, wholesome, and fair throughout the market. Common defects or inconsistencies in meat products that you should look for to prevent dissatisfied customers. How value is determined for meat products and how it is affected by quality parameters. The latest meat cuts, including previously undervalued muscles, and innovative menu ideas. The course is being co-hosted by the American Meat Science Association, the American Association of Meat Processors, Chicago Midwest Meat Association, Canadian Meat Council, Southwest Meat Association, and Southeastern Meat Association. COP is funded in part by the Beef Checkoff, and is co-sponsored by the Pork Checkoff, Lamb Checkoff and Merck Animal Health. For registration details, please go to Center of the Plate Training®. For more information, contact Ann Wells, awells@meatinstitute.org or (202) 587-4252. This entry was posted in Workshops and tagged American Association of Meat Processors, American Meat Science Association, Ann Wells, Canadian Meat Council, Center of the Plate Training, Chicago Midwest Meat Association, Davey Griffin, Jeff Savell, Merck Animal Health, North American Meat Institute, Southeastern Meat Association, the Beef Checkoff, the Pork Checkoff. Bookmark the permalink.